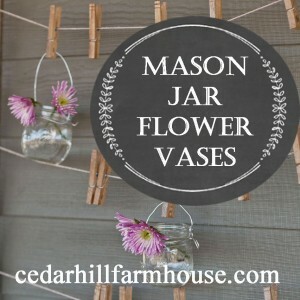 We still have snow on the ground here, but in my heart I am ready for springtime and all of the pretty flowers and faux flower bulbs that come with it! I’ve seen some really pretty floral arrangements with exposed faux flower bulbs but some of them had $60. I decided to come up with a away to get a similar look with a much lower price tag. I bought everything for the project either on sale or with a 40% off coupon. I thought this would be a great budget decorating DIY project to brighten your space! I found these pretty faux tulips at Micheal’s. I liked the greenery they had too.They were less than $2.00 each with the sale. That was less than the flowers they had at Walmart. Remove the leaves at the base and cut the stems of the tulips to the height you would like. I eyeballed mine. First insert the stem into the foam ball with a little craft glue. Then add the dowel piece. Load the foam ball with white craft glue and wrap the paper bag section around the ball. Trim off excess. Tuck under the bottom and twist it on at the top where the stem meet the ball. This makes your bulb. Glue the Spanish moss on at the base. if you’re lucky it has a little wood chip to glue with it.This makes the exposed “roots”. To make a “flowerless” faux bulb, just use a ball and short dowel. I also made an emerging bulb by cutting off the greens from another flower and just using those. While they were drying I filled my moss basket with gravel and river stones. You could use floral foam too if you wanted. I then inserted my bulbs into the stones. You could use some paint to make the blubs look even more realistic, but I decided to leave mine the way they were for now. There’s my little faux bulb on the bottom, just hanging by himself. Since I bought everything on sale and with a coupon, this was an under $15 dollar project. I think it looks way more expensive! For other budget decorating ideas, visit these bloggers! Good morning and hello Spring! 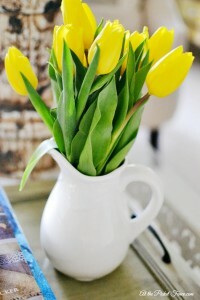 Love this budget friendly tulip project. Will be trying this out in a few days. Well done. Thank you Susie! I wish it was hello Spring, I am ready! OH MY GOODNESS!!! Jen, these are adorable!!!! And so easy! This is my kind of project!!!! Gotta make a bunch for my kitchen island!!! You really got an extra dose of the creative gene my friend!!! I’m thrilled to be working on this series with you! Amazing. I love this idea. Great ideas and great tutorials!!! Very creative! I love how they came out. So pretty! I am so loving this! I always feel like they look so cheesy in the store. A great way to liven them up! Thank you Jen! Thank you Alison! I agree with the cheesy in the store thing too! What a neat idea! It’s SO cute! I have to try this…spring can’t come soon enough for me! I agree 100% Jane! Spring needs to get here fast! Very cute, Jen! I think the bulbs look real enough the way you did them, but you could even rub a little dirt on your paper bulbs as an alternative to painting them. I like that idea Rita, it would definitely make them look way more real! Simply adorably creative. Love it! Just visiting love your idea it was really cute. Oh my word Jennifer those are so beautiful!!! Cannot believe how real they look. You are a genius my friend!! This is such a cute idea! I already have a moss basket. Will have to give this a try soon. Thanks for sharing the how tos’! Seems like we are all ready for Spring and green!!!! Jen, I’m so grateful this winter has been so so much better than last year’s deep freeze with a thousand inches of snow. 😉 But, as the days grow longer I cannot wait for spring! Your bare bulb idea is so clever. I’m pinning and planning to have fun creating some too! You rocked this project for sure!! I am so impressed that you made those!! Wow! They are so charming, and thank you so much for joining me. These are too cute! Can’t wait to get the stuff to make these and I have the perfect container to put them in! I also like Rita’s idea of rubbing the dirt on them! Thanks for the great tutorial and pictures! I am such a visual learner. Great tutorial and so pretty!